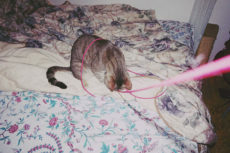 I’ve done a lot of moving around with my first cat, Avery, over the years. 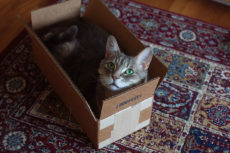 So much that tips on moving with cats was one of the first pet care articles I thought to publish when I started this blog. The moves included a lot of car travelling, but also included two plane rides – first from Canada to the UK, then from the UK to Portugal, both times because my husband Thomas and I were making permanent moves and could never imagine leaving our baby behind in the care of family members or friends. In terms of disposable litter boxes – the way I see it, absolutely anything that can make your life easier, less stressful, and more convenient during times like these: pretty much a godsend. 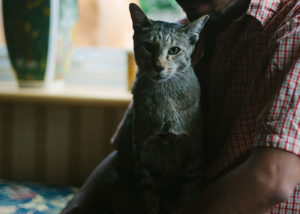 It doesn’t matter how long you travel or how far the trip, it’s important to help reduce your anxiety because it will help your cat stay a lot calmer in turn. I do feel like our pets can feel our stress. 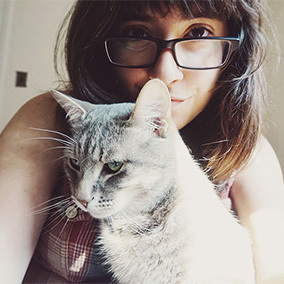 Moving and travelling is stressful enough for our kitties, so any way we can reduce anxiety we have and they have is absolutely worthwhile and incredibly helpful. 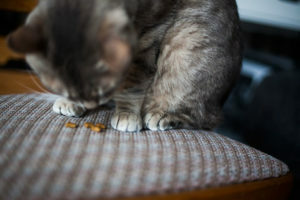 When it comes to disposable litter boxes – I’m going to admit – I’ve never once used them. I don’t even think I realized they were options back when I was moving the first few times, certainly not until I’d done my first flight to the UK. When we did that flight with Avery, we only had the PetMate Sky Kennel, which we lined with three blankets (the greatest idea for comfort and to help keep Avery calm with his own happiness pheromones, but now thinking back, would’ve been pretty terrible if he’d gone #1 or #2 during the flight). 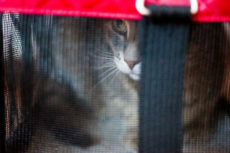 The second trip, we took Avery in his Sherpa Original Deluxe Carrier, and lined it with AmazonBasics Pee Pads – super useful since he did end up peeing, though they were so good at absorbing smells we didn’t even know he’d gone until we arrived at home and took him out of his carrier. There were still lessons to be learned there, as I stacked two pee pads on top of each other (thinking if Avery went, I could take off the first one and leave the second). The pads are so stinkin’ slippery, I should’ve pinned them down so they didn’t move around so much and potentially make Avery uncomfortable. In the UK, we had Thomas’ grandmother buy us some litter and a litter box before we arrived, but moving to Portugal, where we knew no one, we intended to use our portable travel litter box (a small folding one in the style of the Petpeppy.com Portable Cat Litter Carrier) when we arrived. I like to have Avery use travel litter boxes a while before we need them to make sure Avery’s used to the switch, and while doing so, I had the idea of using one of the extra liners refills from my Modkat Litter Box (reviewed here) as a replacement for the travel litter box I had. The only reason I hoped it worked out: Avery is massive digger when he uses his litter box and so I’d end up with heaps of litter outside every time he went with the fold-able box. The Modkat liner worked perfectly to resolve this. It’s easy for him to walk into because it bends when he walks over it, and it contains his crazy digging, as well as most of the fallout when he walks out of it. 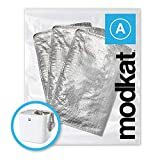 Would absolutely 100% recommend buying a pack of the Modkat liners to re-appropriate this way, as in my opinion, they make for much better travel litter boxes than any made-as-such portable litter box out there. They’re durable, and actually make for excellent temporary litter boxes as well, which I can also personally vouch for since I’ve had two up as makeshift litter boxes for the past couple of months since, unplanned, Thomas and I ended up taking a second, stray/feral neighbourhood cat in, and I didn’t want to jump into buying new litter boxes right away. They’re also super lightweight, easy to clean and fold, and are ridiculously cheap. 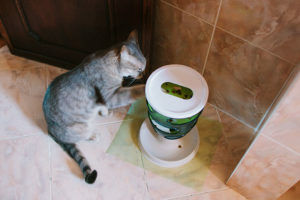 While I’d absolutely do a hard pass on all other travel and/or disposable litter boxes now that I’ve fallen in love with them, considering their low cost and compact size, even if you’d like to try something else, there’s no harm in grabbing one as a backup. These are probably the most popular disposable litter boxes around, likely in large part due to how ridiculously affordable they are. They’re waterproof trays, and are supposedly really great disposable litter boxes albeit their low price point. Since I have no firsthand experience with them, and I’ve managed to find a great review, if you’d like to read a firsthand review of these, check out this excellent one by an Amazon reviewer here. Second place goes to Kitty’s WoderBox disposable litter tray, but these look to be almost if not just as good as the Nature’s Miracle disposable boxes. One reviewer mentioned: “These are disposable. Scoop them daily and you can make the tray last a month. Easy to replace, no mess. I use these trays inside of a large, plastic, covered cat box as my cat likes to kick litter everywhere. As these come in a pack of three, you can easily make them last three months with regularly scooping.” Should be absolutely perfect, even in cases where you’re travelling for quite a while or need a temporary box for a reasonably lengthy period of time. Really prefer to have a disposable tray in your storage room that already includes litter in one easy-to-pull out package? Cat’s Pride KatKit litter boxes are probably the most popular option in this department. They are supposed to be a little thin, so my guess is that cats who are aggressive in the litter box (like my Avery!) would tear them to shreds, while they’d be flawless for cats who are sane in the kitty loo (like my Bjorn). One reviewer mentioned how perfect these are for road trips, and I have to say, they likely are the best bet for that type of travel considering you don’t have to lug around a litter bag to fill them up before use. Want to use your own litter, but love to have a plastic material that’s lightweight, easy to stack, easy to dispose of, and just plain convenient all ’round? These Argee Kitty Lounge plastic disposable litter trays are an excellent bet, especially considering all the glowing reviews they have. 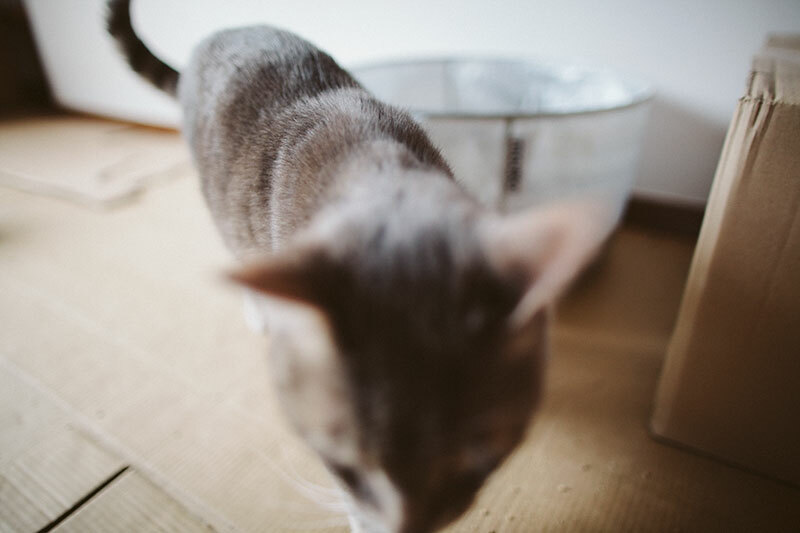 If your cat is like my Avery, and really is quite an aggressive digger when it comes to using the litter box, you’re likely going to want to opt for a disposable litter box that’s also enclosed/covered the same way your regular litter box likely is at home. This particular one looks quite sturdy in reviewer pictures and based on what quite a lot of reviewers have to say, they are actually pretty darn sturdy, even if you set them up and take them down quite often. Would absolutely look into this one if you’ve got a litter fiend like I have. 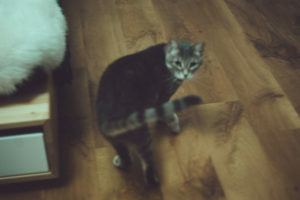 LitterMaid’s Odor Control disposable litter pans are comparable to the ones by Nature’s Miracle and Kitty’s Wonderbox. I do think they’re well liked, especially at keeping odours to a minimal, but be aware, one reviewer mentioned their height is not as high as advertised, so if you were looking for a very deep, tall tray, you may not get what you were after with this one. 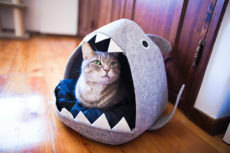 Love the idea of a covered litter box that’s disposable, but rather it come with litter? 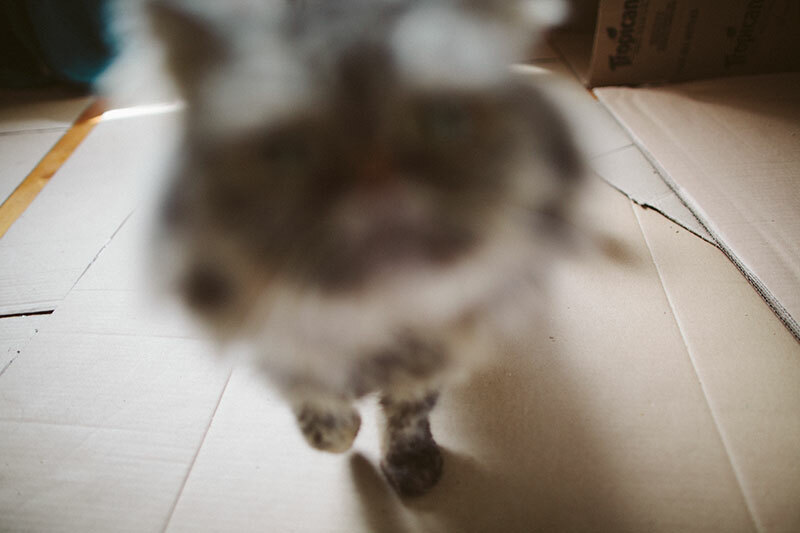 Try the PetSafe Disposable cat litter box, which comes with crystal litter. Seems like this litter box, due to being collapsible, is incredibly easy to open and close. This feature could come in incredibly handy as well! Not one of the most popular litter boxes around, but in my opinion, it looks like a solid option regardless. 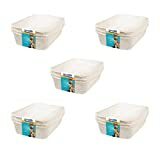 This one can be used as an open litter pan or a covered litter box, and if I’m correct, you get 10 pieces with the pack which can either be used as a top or bottom portion. 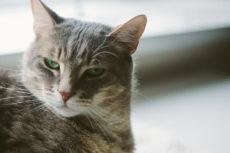 So if your cat only destroys the bottom portion, you can keep replacing only that portion, and if you want to use all 10 pieces as litter pans, you can absolutely do that. Really love this idea. Another solid option that’s pop up or collapsible, but this time only comes in the shape of a high side litter pan. These look great as well, solid looking and come with handles. Definitely viable if your cat isn’t crazy in the loo like Avery. 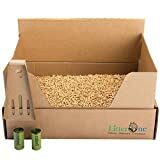 The Litter One Kit is a biodegradable disposable litter box that also comes with biodegradable litter made of pine pellets. While it’s not got a covered hood, it does appear to be quite a high litter tray style disposable box, which is handy in cases where you have an aggressive-in-the-loo cat who also really dislikes covered boxes sometimes. Don’t want accidents because kitty hates their travel litter box! Your Thoughts on Disposable Litter Boxes? Have you ever used a disposable litter box? If yes, when you used it were you moving? 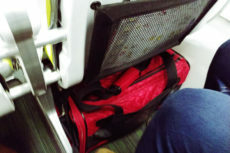 Travelling with your cat? 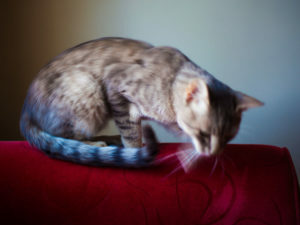 Dropping your cat off at a friend, family member, or cat sitter’s house before leaving for a time? 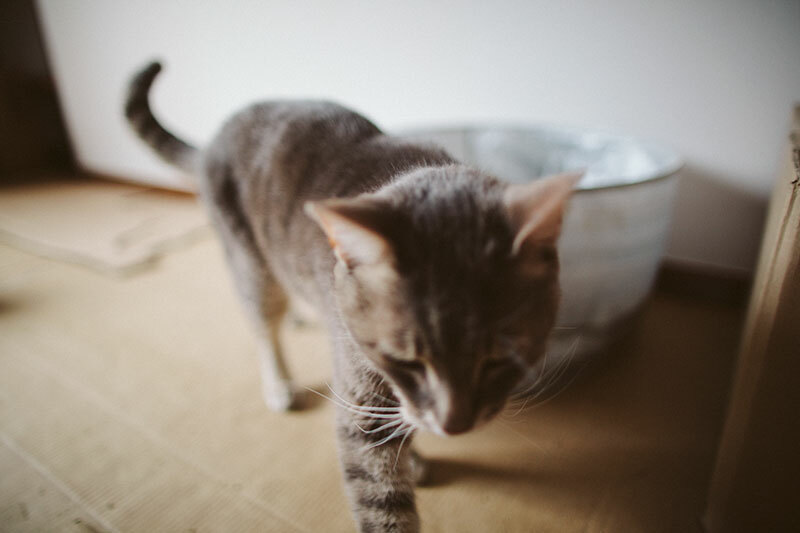 Which type of disposable litter box do you think is best? 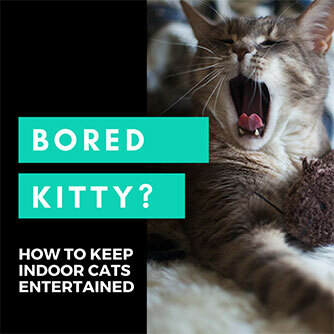 Do you prefer to DIY a disposable litter box solution or use a travel litter box instead?